Just a few years after the Humane Society of the United States (HSUS) released undercover footage exposed the ongoing torture Tennessee walking horses endure to achieve an unnaturally high stepping gait known as the “big lick,” the organization has released the results of another investigation showing the illegal and abusive methods used to get the big lick are still sadly being used. This time around, an undercover investigator documented abusive practices at ThorSport Farm in Murfreesboro, Tenn., which, according to the HSUS, is well-known and highly regarded within the big lick show world. The abusive practices used to get the big lick, otherwise known as soring, include: putting caustic substances, such as mustard oil or Croton oil mixed with kerosene or diesel oil, on the sensitive skin around their hooves at their pasterns, bulbs of their heels and coronary bands to cause blistering, burning and irritation; and wrapping them in plastic wrap to make sure the substances are absorbed, which makes them quickly lift their legs to avoid pain. Pads, or stacks, may also be used on the front hooves to raise a horse’s forehand to add even more animation, but this causes unbalanced feet, among other problems, while pads can also be used to hide objects like nails to cause more agony. If all that doesn’t do the trick, chains can also be used to add to the pain, while some also use salicylic acid or other agents to cover the visible damage that’s been done. After all of that, some horses are trained not to react to having their legs touched to pass inspections at shows. Soring of all breeds has been banned for decades under the Horse Protection Act, but the technique is still clearly being used by unethical trainers to get that high step – causing the needless suffering of countless horses for nothing more than a win at a show. According to the HSUS, more than 60 samples were taken off horses whose legs had been wrapped in caustic chemicals, and all of them tested positive for substances that have been banned from use in the show ring by the U.S. Department of Agriculture. The evidence collected was turned over to the Rutherford County Sheriff’s Office, which opened an investigation earlier this month that is still ongoing. Duke Thorson, the owner of ThorSport has denied there’s anything illegal going on, but several employees, along with the his own daughter, already have histories of violations under their belt. 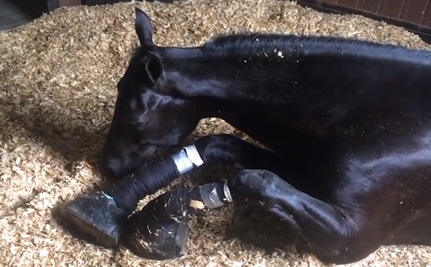 This investigation proves that the practice of soring is alive and well in the heart of Tennessee walking horse country, and that some top trainers and owners in the industry are complicit in the abuse. The pain and suffering our investigator documented inside ThorSport Farm is nauseating, and unfortunately continues unabated despite the industry’s persistent, false claims that it has cleaned up its act. Congress must recognize the need to pass legislation that will finally protect these majestic, gentle animals and give them a fighting chance. Now the HSUS and equine advocates are pushing for Congress to crack down on this cruelty by passing the Prevent All Soring Tactics (PAST) Act (H.R. 3268/S. 1121), which will hopefully end some of the worst abuses found in the industry by banning action devices, including stacks and chains, ending the industry’s self-regulation and strengthening penalties for violations. While we urge lawmakers to act on behalf of these horses, we can help by not supporting the ridiculous standard that these trainers are trying to achieve just to win in the show ring. Please sign and share the petitizon urging Congress to pass the PAST Act. For more info on how to help these horses, check out For the Tennessee Walking Horse. Where there is money involved there will be abuse. After all, it's just a "dumb animal". When they get caught like this they should be treated to the same techniques as the horses and see how high those slime buckets can step... The only good description of these people is that they are monsters. They must be if they can inflict this much pain on an animal for money or ego. Why don't they go after them as strong as they do dog fighting or other abuses? A million stars to Kathleen! You are so right about the GSD. My heart breed. Damn show people have taken what was a strong working dog and turned them "pretty". Pretty lame. Pretty roached and weak back. Pretty dysfunctional. Pretty nervy. Pretty that can't even lift their feet off the ground properly. "Pretty" is pricey. Pay big bucks to get a "pretty" dog. It is awful what they have done. Caitlin, I believe you. I've seen trotting racers in this country, but the fastest don't trot, they pace. I've never heard of any cruelty involved in this. Past Tennessee Walking Horse owner here. I have seen Walkers racking on their own, no cruel practices used. I've seem horrible practices on some, yes, like dozens of nails hammered into their hooves from every direction. My neighbors and I have never done that, so not all Walkers you may see doing this are doing it out of pain. What you see is the exaggerated gate they naturally do. Just keep that in mind before anyone here attacks every owner they see with a racking horse. Shameful practice, in the name of supposed entertainment. No animal should be abused like this! Some state legislatures are passing laws to make it illegal to use undercover video to expose the torture and abuse of animals. Unless we rise up to stop this inhumane treatment and these anti-filming laws we all lose our humanity. It may be too late as it is. Kathleem M, you are right, but horses are normally bred to move well, which spares them from the worst of this. However there are breeds and species of bird that suffer from being bred into unnatural shapes for the same reason as the dogs - the fancier's ego!